What is the current status in the field of SmartHome technology? You need a connection to the wireless router or to a control center, which is usually referred to as a hub or gateway. As a control, the smartphone is used, without connection to the smartphone control is hardly possible. 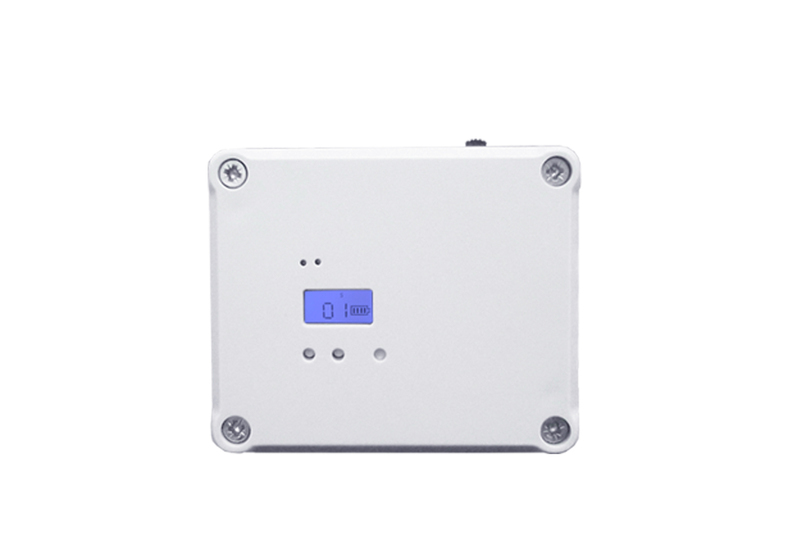 This is due to the radio protocols used, usually the devices are connected to ZigBee, ZWave or DECT radio protocols. Since these radio signals can not work directly with the domestic WLAN network or with the smartphone, the detour via the gateway, the DSL router and an Internet server is used. The switches and the smartphone as the control center "meet" in the external server, where the commands are converted and sent back to the device. 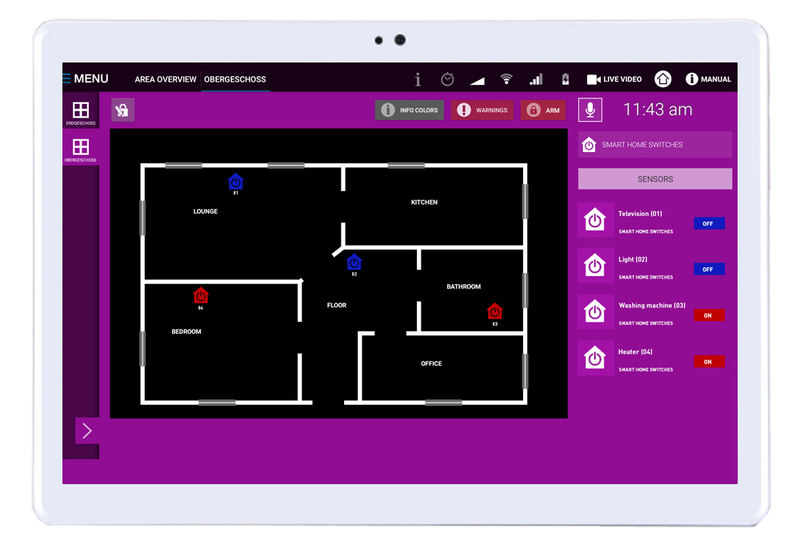 This is also how the SmartHome controllers offered by burglar alarm systems work. Mostly then the gateway is installed in the alarm center, so that the user does not have to deal with 2 control panels. As an alternative to smartphones, voice-controlled devices such as Alexa, Google Home and Apple's Home-Pod have recently come onto the market. Instead of the display of the smartphone, spoken words are evaluated on the servers of the corporations and the control commands are sent to the devices at home. Every user should be aware that all spoken commands are stored on corporate servers and evaluated for advertising, etc. You can not control the devices without a smartphone or voice assistant as the control center. Without active WiFi and Internet connection, no control is possible. All access data and commands are stored on the mostly foreign servers, what happens with this data, beyond the influence of the user. 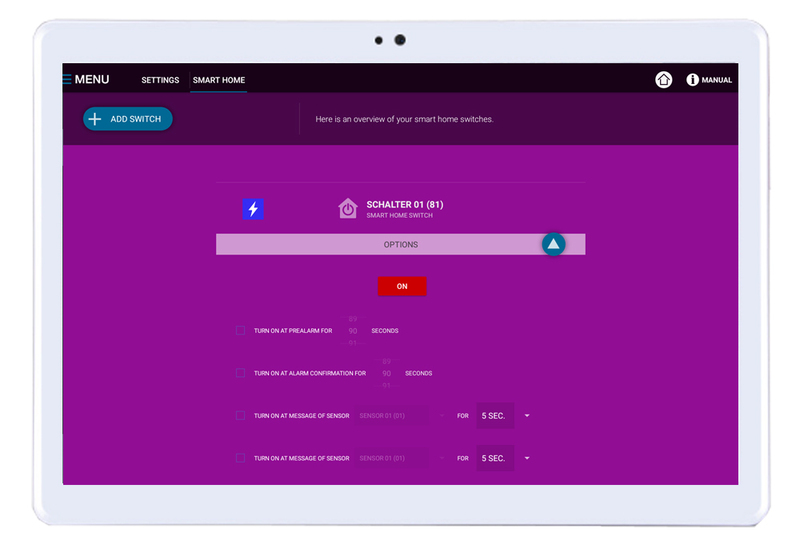 The main task of the development of SmartHomeTab was the creation of a control system that works without the existing disadvantages of the otherwise available SmartHome technology. This was achieved by having the remote switches work directly with the control center, without the need for intervening the usual gateways and hubs and servers. The signals of the switches and the control center are exchanged directly by Bluetosec radio signal. As the basis for the Bluetosec wireless technology, the wireless world standard Bluetooth LE was used and further developed into a wireless protocol that can be used in switches, transmitters, sensors and mobile devices such as smartphones and tablet PCs. This allows all devices with Bluetosec wireless technology communicate directly with each other, the wireless range is up to 50m in buildings and up to 250m in the field. 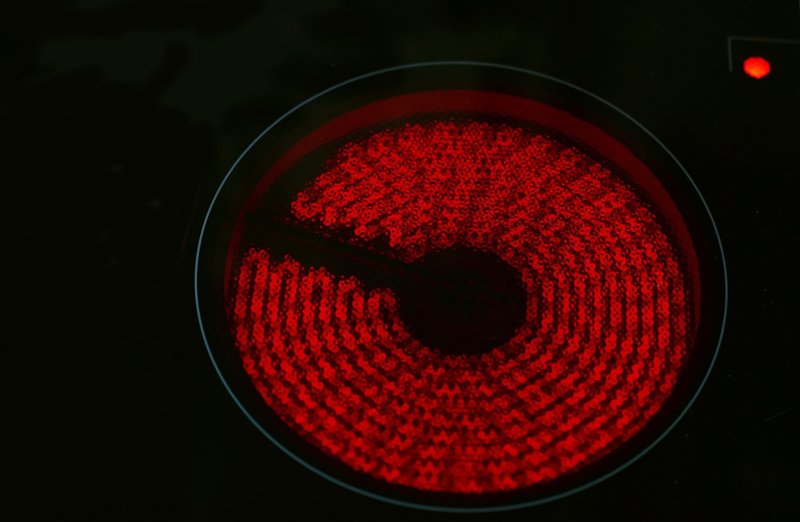 In practice, the switches on the large touch display of the control panel can be switched ON and OFF simply by touching them. At the control center, each user can create the floor plan of his building in any number of floors and areas and place the switches in these floor plans. So you can see at a glance which switch in the building is on and off. SmartHome means: intelligent, clever. It is therefore important that the switches can not only be programmed and switched via the control panel but also arbitrarily according to the "IFTTT" principle (if this than that = if this happens). 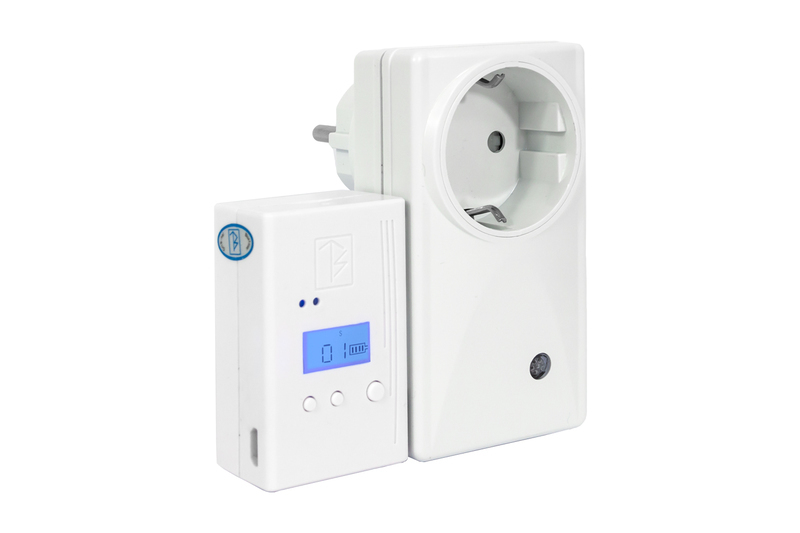 Switching by any sensors such as window / door, motion detector, smoke, water, etc. All these programming can be easily adjusted on the display of the control panel by simply tapping the desired functions. Since SmartHomeTab is a self-contained control center with a variety of uses, we would like to highlight a few examples. 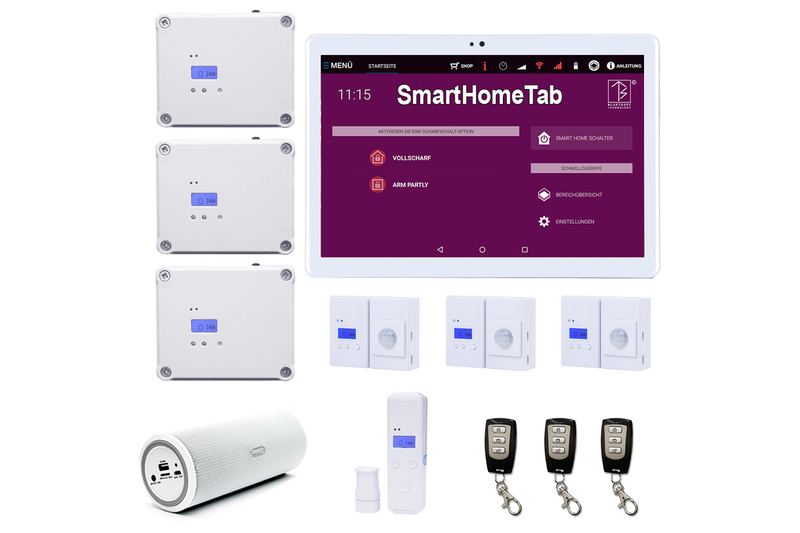 All functions of SmartHomeTab are included in all other security systems of the TabTechnic product family. 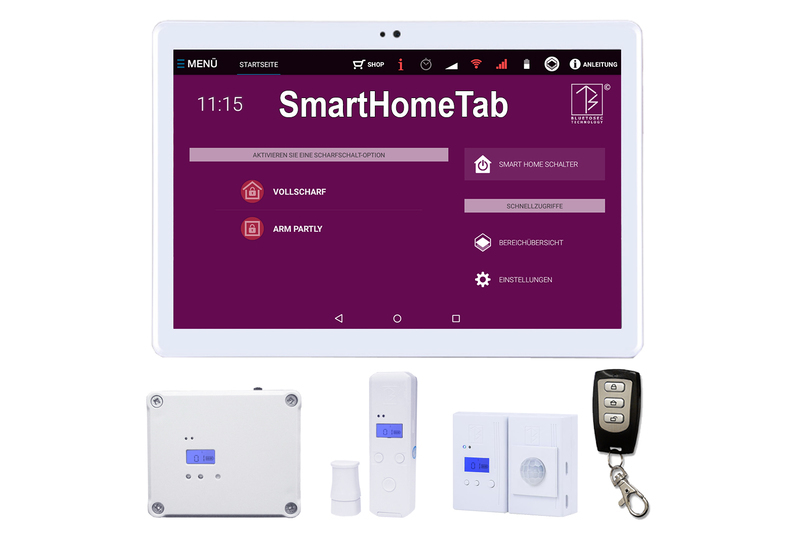 This means that all SmartHomeTab functions are also included in the AlarmTab® burglary protection system, in the SmokeTab fire protection system, in the CaravanTab vehicle protection system, etc. And all sensors, be it door-window sensors, motion detectors, smoke water, gas temperature sensors etc. 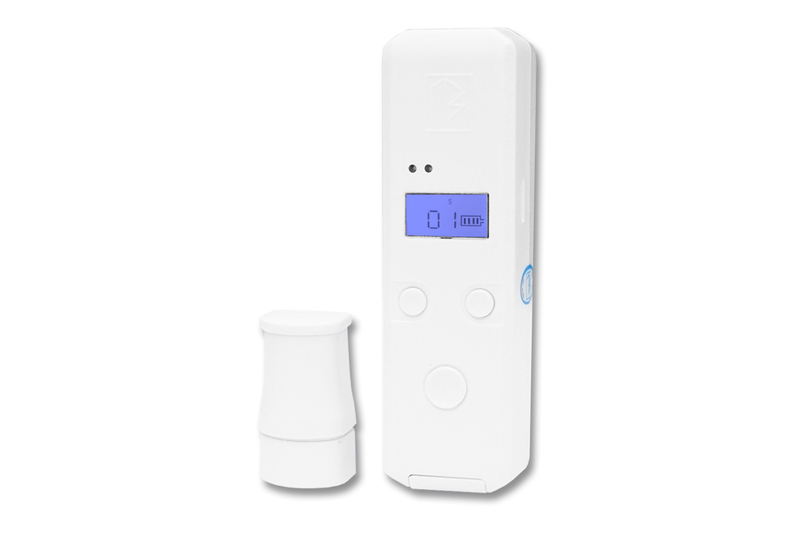 can be used in SmartHomeTab and all other protection systems. 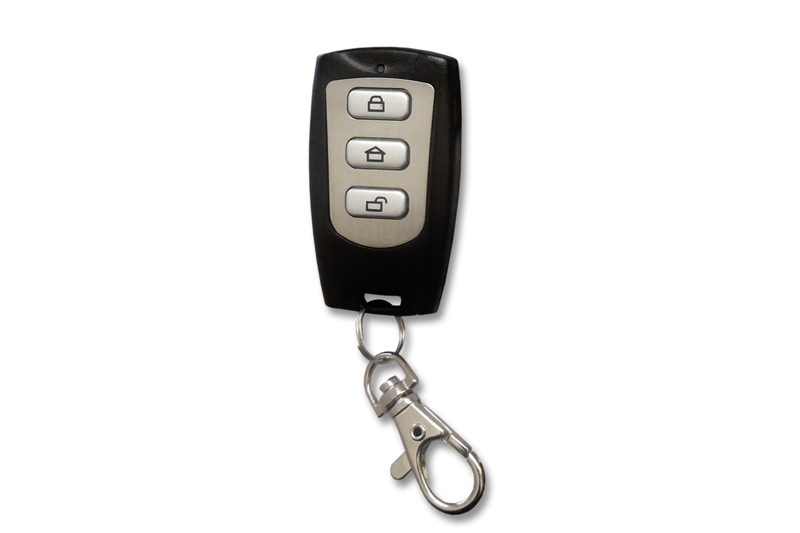 This offers the user maximum flexibility and possibilities of use according to their own needs. There are many possibilities for switching the light. For example, the radio signal of a door sensor or motion detector may be used to turn on the light inside or outside for a set period of time. When someone enters the room, the light turns on, all people leave the room, the lights go off, which is convenient, safe and saves electricity. Or an outdoor sensor registers a movement at agreed times, which deterred burglars and provides security for the occupants. 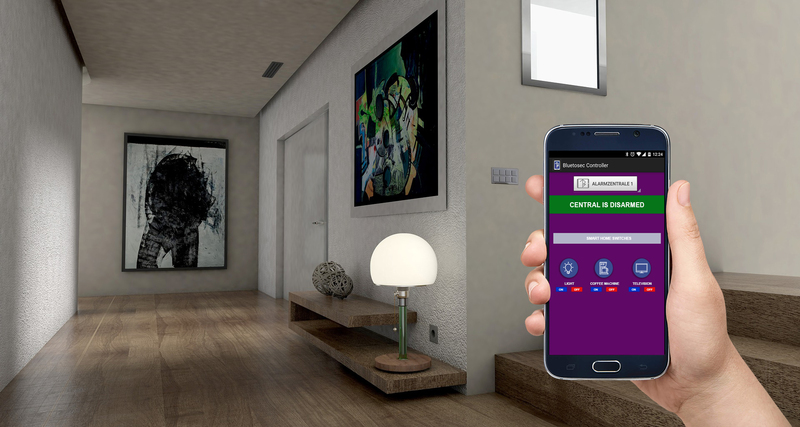 Or when arming the burglar alarm system AlarmTab® the light is switched on and off in changing rooms, which simulates presence and deter burglars. The circuit can be done by sensors, events, by time or remotely via smartphone, everything is usable. An outdoor sensor registers at agreed times or when the control panel is armed, the SmartHome control can start the siren for a few seconds, this will deter burglars without annoying the neighbors. Or in the event of an alarm, the siren is started, and can be controlled by smartphone at any time, so the siren can be remotely switched on or off at any time. With the smartphone app you always have everything under your control. Presence simulation is a very strong protection against burglars, let the shutters down at different times or when triggering an outdoor sensor. 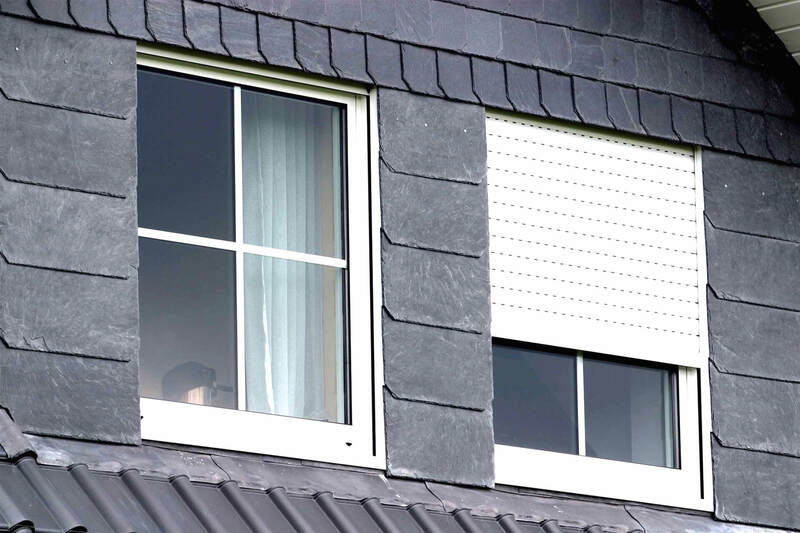 Or close the shutters via smartphone, tablet PC or PC when a storm is approaching and you are away from home. 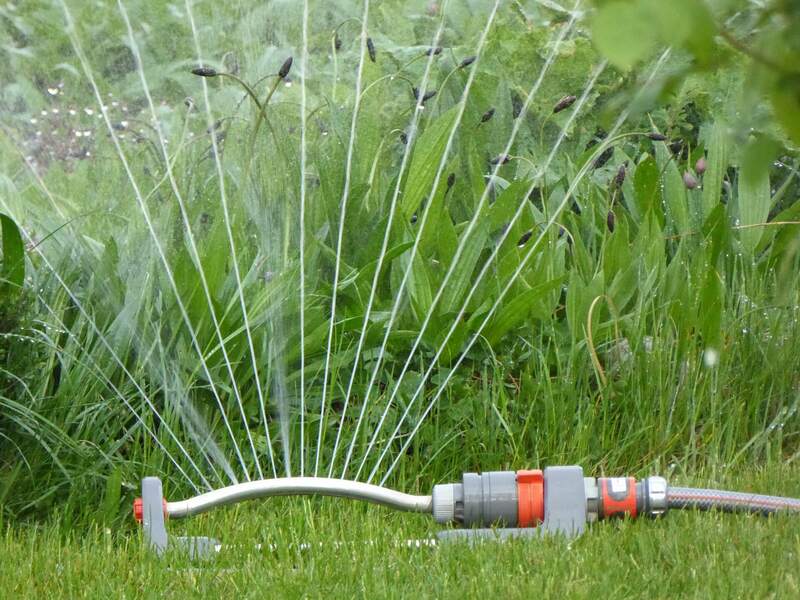 You are on holiday, but the sun is burning at home and your garden or lawn needs water. Control the rain sprinkler through your Smarthome Central, or water your garden by command from your smartphone while you're on the beach on a well deserved vacation. 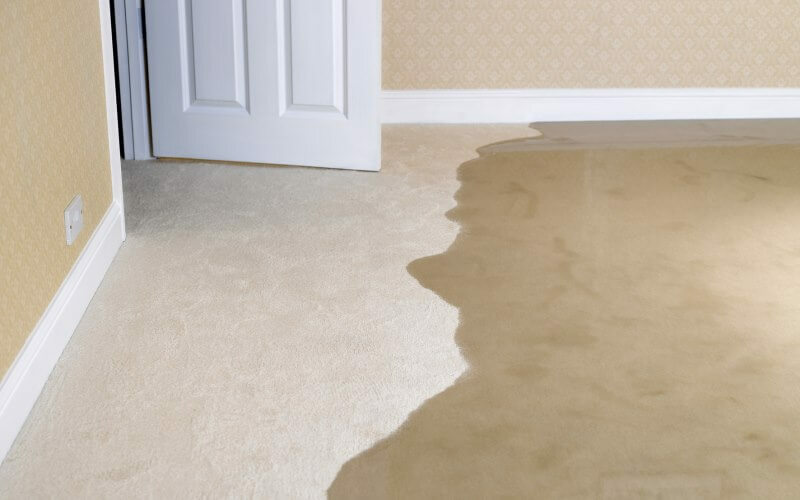 A burst hose or conduit damage can cause expensive water damage. 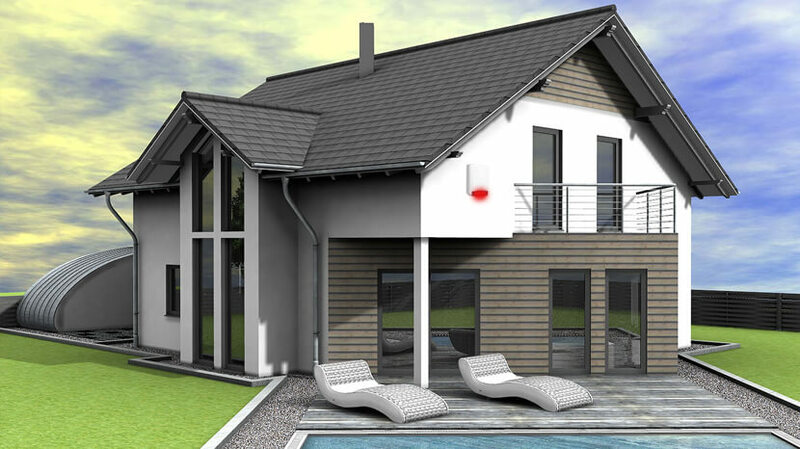 A solenoid valve in the main line is automatically closed by your SmartHome control unit as soon as the wireless water detector sends an alarm signal. 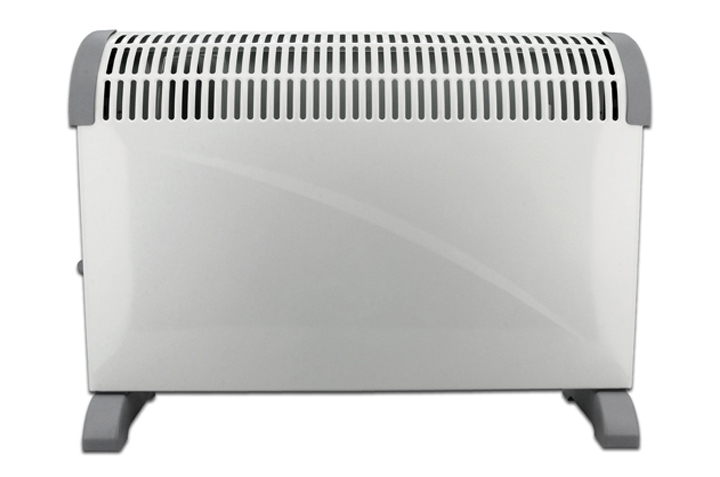 You want to save heating costs and have equipped your thermostats with a radio control. Then let the temperature drop automatically as soon as you leave the house. And turn the temperature back on via smartphone, even before you arrive home. Do you use a fireplace because it is so cozy and saves heating costs? 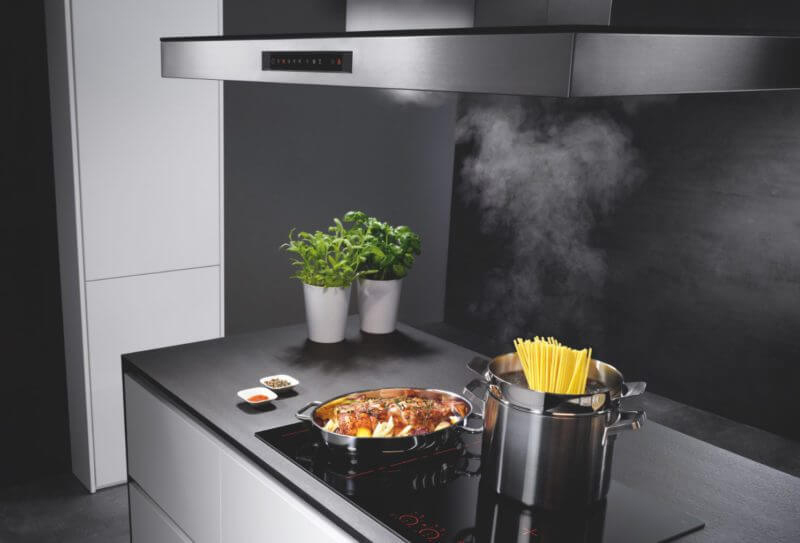 Attention: turning on the cooker hood without opening a window will allow poisonous carbon monoxide to be drawn into the room. A window sensor helps to prevent this, it allows the activation of the hood only if the window was previously opened. An incorrect operation and danger is thereby prevented. Take advantage of the SmartHome center's many capabilities to protect your family and home while you're at home or on the road. 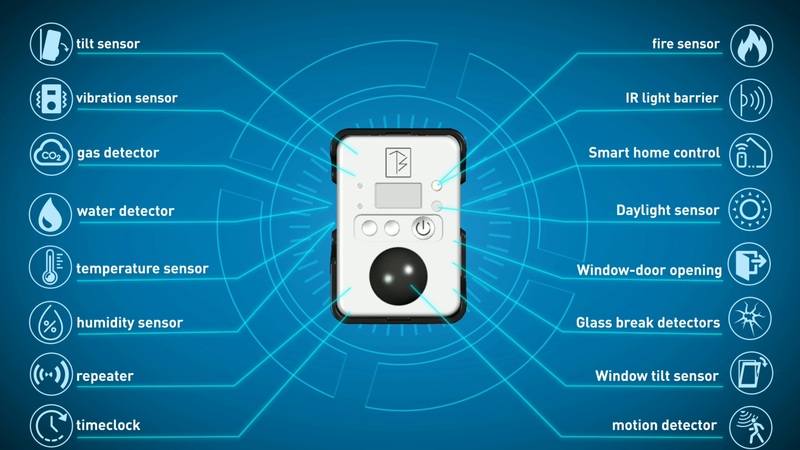 Intelligent burglary protection can already be achieved with just a few sensors, by presence simulation or by switching on the radio or alarm loudspeaker with angry dog barking as soon as a sensor has detected a movement. Or switch the video surveillance to recording as soon as a sensor triggers. 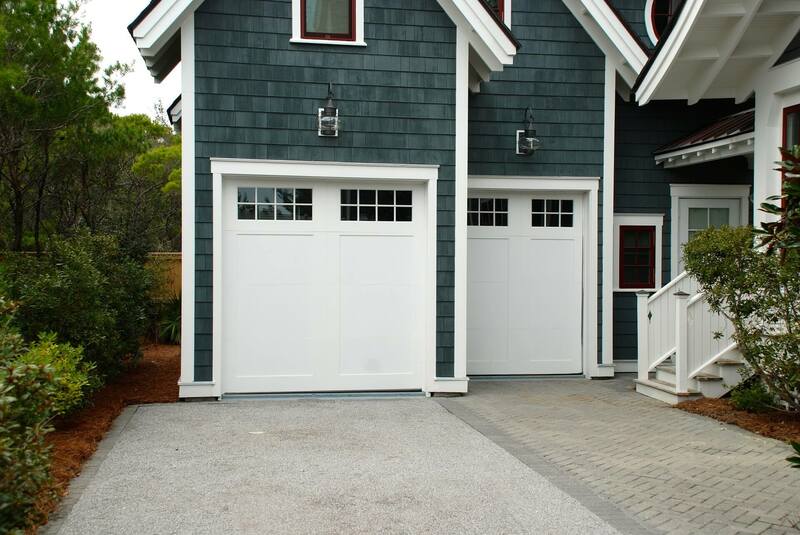 Opening and closing the garage door or front door automatically from the control panel or smartphone saves time and is convenient. And once a family member has locked himself out, help is just a click away. These are just a few examples of your future SmartHome controller. Start into the future now, anything is possible, with the Tabtechnic security systems there are no restrictions.